Nokia decided not to fall behind it’s competitors and presented a phone with built-in targeted mainly for the youths. 3000 series number in the name of the model proves that it belongs to a not very expensive segment. Basically, it’s the very same Nokia 7250i, which is still manufactured and has stable sales in it’s segment. 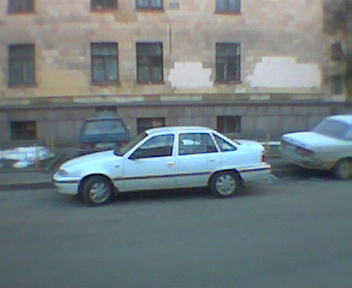 Nokia’s engineers decided to use a beaten path, and not to develop a bicycle once again. 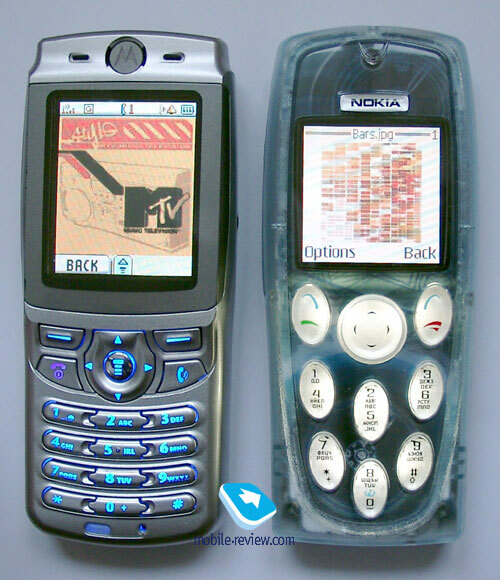 Existing model was adjusted with stylish design aimed at youth, little software update and vou la – we get a Nokia 3200. The design can’t be called otherwise than youth. 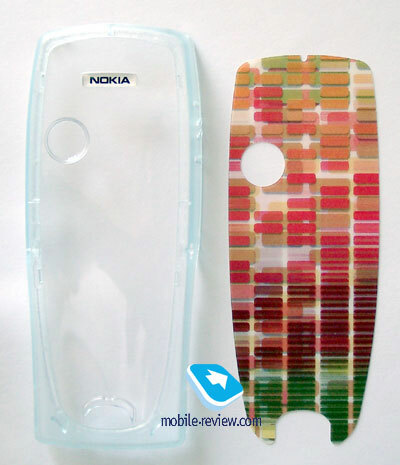 Transparent plastic is used for case, cheerful graphical ornament. On the front panel the plastic is smooth and transparent, so you can see clearly the cut-out cover. It makes the phone look unique and original without a doubt. It’s not hard to take off both panels, meanwhile when they’re on the phone – it doesn’t squeak a lot, just a little crunching whenever you clang the phone. Each phone with exchangeable panels has one of the two disadvantages: either it’s panels are really hard to remove, or it squeaks like an old door. No phone which wouldn’t have one of these terms on board was released yet. 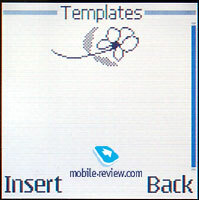 Each panel has special slots (in the intern side of course) for placing a picture of your own, or an existing template. 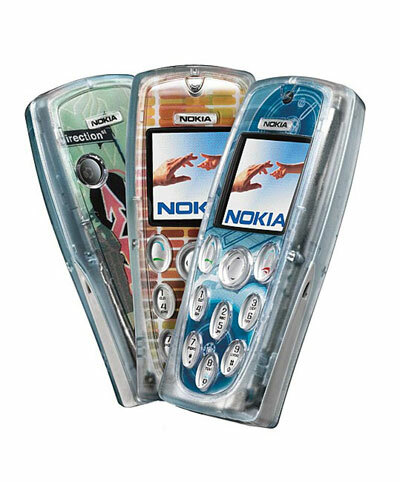 Nokia decided to include three templates with every phone. One of them is already installed, while the rest are lying in the box. Different pictures can change the phone’s outlook very much; sometimes it’s even hard to believe that this is still the same phone. There are stereoscopic images which are changed depending on the viewing angle. Nokia is going to sell such kind of pictures just like new covers for other models. If you consider yourself as a creative person – you can create your own “skin” for 3200. All you need is scissors, the paper/magazine/picture/etc. you are going to place inside your phone and some patience to finish up the whole thing. Panasonic was first to introduce something similar to this with it’s GD67. 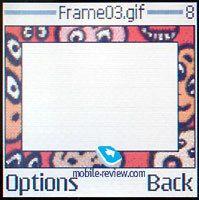 You could place any image under the transparent back panel, and special pattern for easier transfer. 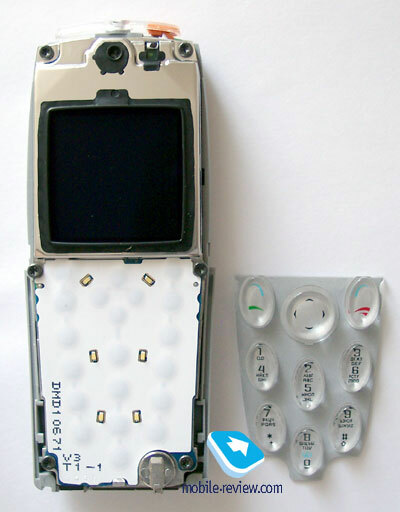 Nokia 3200 doesn’t have a pattern, but it has ten sheets with cut through templates. You can place them into the printer and print the image you like. I decided to make an experiment, and gave this phone to my neighbor, a typical student at the age of 15. 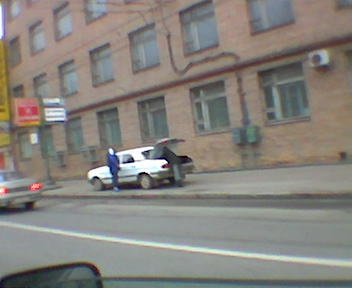 He returned the phone with the picture of BMW located on the back, and t.A.t.u. girls on the front. Everything was done nicely, even though I didn’t give him the templates. So it’s not hard to create a design of your own. A cutter was supposed to be shipped in every box, but either Nokia just didn’t make enough of them in time, or just decided to experiment with something. However, now you can order a cutter from the official web-site: http://www.nokia.com/phones/3200/cutter or just write a letter to the company. You will have to provide your IMEI as well, in order to receive the tool. A lot of people will like the idea of having no templates inserted in the phone, this way the phone looks completely naked. Since the plastic is very smooth – scratches are starting to appear with an amazing speed. If you use the templates – it’s will not be very notably. Because of this peculiarity the phone ships with pellicle attached for both, the screen and the back cover. Plastic is shaggier and mat on the sides and edgings. It’s no wonder, these parts of the phone are the most subjected to wear. If you prefer carrying your phone in the same pocket with keys – I have to warn you, it’s a bad idea, the phone’s case will be damaged in a matter of days. Putting Nokia 3200 into leather case doesn’t seem a very bright idea, this phone is all about design and outlook. Hand strap can be found in the package list. The hole for strap is located on the top, near Power On/Off button. 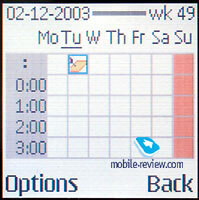 The display is typical for this segment and current Nokia phones. It can display up to 4096 colors, the resolution is 128x128 pixels (28x28 mm, although the manufacturer claims that it’s 27.3x27.3 mm). Five text lines and two extra lines for service needs can be displayed at once. When the phone encounters direct sunlight, the screen turns pale, although it’s still readable. More serious problem comes with choosing the right color theme. Your choice will not only define the color of the menu, but the same color will be set forservice icons during stand by mode. In my opinion, most of the variants (if dark wallpaper is chosen) look awful, you have to put a great amount of effort to check the network or battery status. The optimal choice will be black indicator with white wallpaper, but this combination is found only in one color set, but in that case the other menu items will look crappy. You will have to find a compromise, although most of the users will not find this problem important. Perhaps they will be right, but this issue doesn’t bring any positive thoughts. 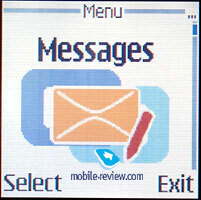 The display has one obvious advantage, clock and current status (missed calls, received messages, keyboard block) is shown on the black screen during the stand by mode. It’s made for energy saving needs, as well as preventing the user to unlock the keyboard each time there is a need to see the status. The keyboard looks very attractive, especially when the backlight is activated (its color is white), the symbols are clearly seen in all conditions. However, the ergonomics suffers badly. Buttons are grouped in pairs, it’s okay for soft-keys, but not good for the keypad. Sometimes when you’re typing an SMS you might press the other button instead of the required. It takes about 4 days in order to get used to it, however even after such period of time there is no guarantee that you’re safe from making typos. Inconvenience plays a significant role when you’re playing Games. It becomes rather difficult to play Bounce at first. The Navigational key is 4-positional and doesn’t support pressings. It can be rated as average on the comfort level scale. Digital camera is located on the back, it has CIF resolution (352x288 pixels). Back panel is used as lens protection, if you remove it you’ll see that the camera is located in the phone’s body. The battery is Li-on 780 mAh type, once again Nokia decided to use BLD-3 model as the battery. It was typical for the phones of the last season. 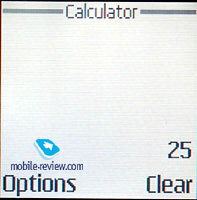 Nokia claims that the phone will work up to 250 hours in stand by mode and 4 hours during the actual talk. While we were testing the phone, it worked for 3 days with 45 minutes of talks and up to 25 minutes for games spent daily. It takes slightly more than 1 and half hour for phone to charge up. Charging connector is standard, it is placed at the bottom of the phone near the Pop-port connector. One of the peculiarities is that the ring tone sound comes from the left side, the holes are rather big, and so the sound volume is higher than first Series 40 models (Nokia 7210/6610). Although the volume doesn’t differ severely. Built-in flashlight is located on the phone’s bottom. According to the manual, it can be activated even if the keyboard is locked, however the phone which was used for the review didn’t support that function. I had to unlock the keyboard first, and hold the “*” button in order to activate it. The flashlight itself is very bright, so it can be used not only in doorway, but on the street as well. Phone’s size is typical for its segment (107.5x45.1x20.8 mm), as well as it’s weight (90 grams). So, you can wear it almost everywhere. It’s been a while since 3000 series model had a IrDA installed, but now it’s back. IrDA is located on the phone’s top. With the appearance of IrDA Nokia 3200 gains several positive scores, for the first time you can actually send photos to other phones. Earlier on this was impossible because network operators wanted to get more money for GPRS and MMS services, however Nokia decided to support its customers. Another thing I can’t figure out is why Nokia decided not to use animated icons in the main menu. The only possible theory I came up with is Nokia’s policy – if you want to have animated icons – buy a more expensive phone. It means that the problem of customers inequality lies mainly in marketing and doesn't depen on technical problems or something else of that kind. 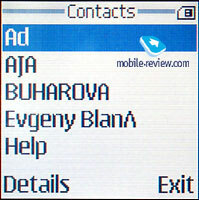 It’s a typical Nokia phone, the main menu is introduced by a list of icons with titles. Just like in all recent models, you have the ability to change the main menu look to a table of icons (10), like the one used in Siemens phones, three icons per each row, and scroll option for 4th row with 1 icon. You can use shortcut number navigation in both variants. All sub-menu is presented with traditional lists, shortcut number navigation is supported. You can also use personalized menu, “Go To”, bind to right soft-key, which can be activated from stand by mode. The 10th item of the menu is this “Go To” menu. I couldn’t figure out why Nokia decided to make it a separate menu-item. It’s meant for quick access, and going to menu first, to use this function seems nonsense. The phone’s memory is shared dynamically, the memory itself is 1mb, which is rather little for a phone with camera. Phone book. Several phone numbers can be assigned to one entry, besides, there are certain icons for every phone number type (home, work, mobile, fax). The number you enter first – will become default for this entry. You can change it if necessary later. Each name can be associated with an image or a photo. At last! The image will be moved to special folder and resized to appropriate format. It’s a great feature overall, specially because the original image will not be harmed, it will remain unchanged. On the other hand, resizing will result even worse quality, and it becomes rather hard to recognize the face. The picture will be displayed on Incoming call, as well as the name. 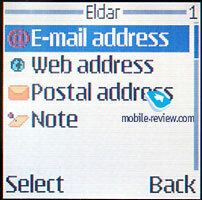 You can also add www-address, small text note and full mail address to every contact. Not looking at the fact that this phone has dynamical memory system, the maximum amount of names stored in phone’s memory is 250. 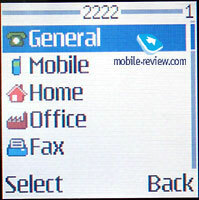 Traditionally, the phone supports Groups for phone book entries, each group can be assigned a personal ring tone. Up to 50 voice dialing records can be used for entries. Messages. Normal keyboard makes typing a lot easier, that’s why Nokia decided to provide this model with all possible enhancements for text communication. SMS sending/receiving is not a surprise, as well as T9 support. 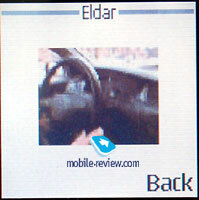 The phone supports EMS, although it’s just Nokia Smart Messaging, which means sending and receiving pictures in own format, which is compatible with other phone producer’s phones (Samsung, LG, Motorola). 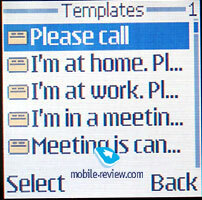 The phone only 10 graphical templates, they are simple images which are known for about 4-5 years. Keeping the tradition is always nice, but we definitely wanted to see something new and modern. 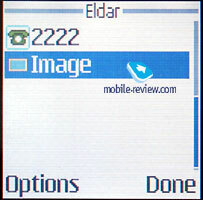 Unfortunately, the phone doesn’t support “real” EMS, the messages that were sent to Nokia 3200 weren’t readable. Phone can store up to 50 sms. Concatenated messages are supported as well, maximum length is 885 symbols (6 messages). 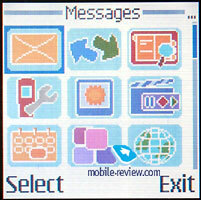 Distributions lists can be formed, if you wish to send one sms to a group of people. On the other hand, limitations for MMS which have been in the first Series 40 phones were removed. You can also create several pages of slides and add your own files to each page (images, photo, ring tones). The limit exists for the whole message (100 Kb), and not for the number of objects. 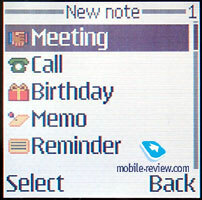 You can even send Dictaphone’s records and video clips made by built-in camera.. Call list. 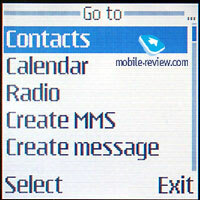 Consists of a traditional list of Received, Dialed and Missed calls. Each list can store up to 10 numbers. The call length and cost is shown here as well. Mixed call list is absent, though it in my opinion it is not very convinient. Settings. From here you can set up wallpapers, contrast level, color schemes, automatic key-lock and shortcuts for left soft-key. Profiles are located in this menu as well. The many profiles can be set by you to activate at different scheduled times. Also the type of tone, volume and vibrating alert, keyboard tones and SMS alert type can be set up in each and every profile. For the first time Nokia has also introduced a call filter - an analogue feature that Siemens phones has been equipped with for a long time. Basically it’s about setting filters for allowed calls. I.e. you can set a filter for Phonebook entries, and as a result only calls from listed phonebook contacts will be accepted. 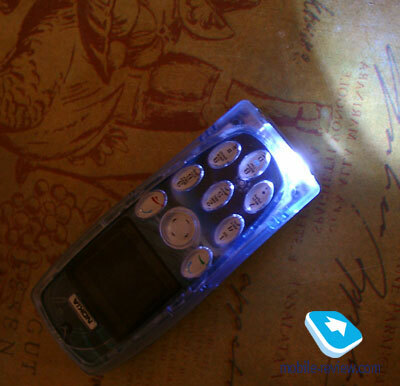 If someone not listed will call – your phone won’t ring, instead it‘s backlight will flash. 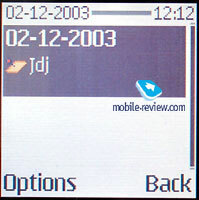 Changing profiles by shortly pressing power button on the top of the phone is much easier, than doing it through the menu - also a standard Nokia feature. Gallery. 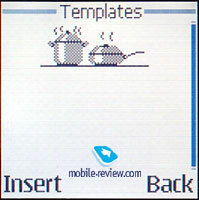 Basic set of various folders is located in this menu. Pictures taken with camera are stored in separate folder. When you’re previewing images, you can call the built-in editor that will allow you to modify the picture a bit. You can set up frames for any image, which allows to customize it the way you want it to be. From now on you can experiment with different frames without being aware of ruining the original. 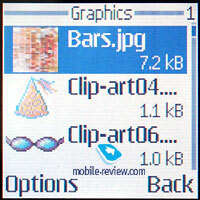 Some pre-installed ClipArt pictures can be placed on existing images, and moved according to your will. 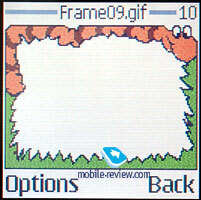 Finally, you can decrease the picture’s size by cutting off unnecessary parts (by block). That’s all what built-in editor can offer. A new item appeared in Gallery Index, it’s about copyright. Seems that Nokia decided to include it because of major operators, who want to make sure their “property” (logos, ring tones) will not be distributed. Pictures that are protected this way cannot be moved or sent anywhere. The only thing you can do with them – is to delete or use it as wallpaper/screensaver/ring tone. Media. This menu item consists of three sections: Radio, Camera and Dictaphone. 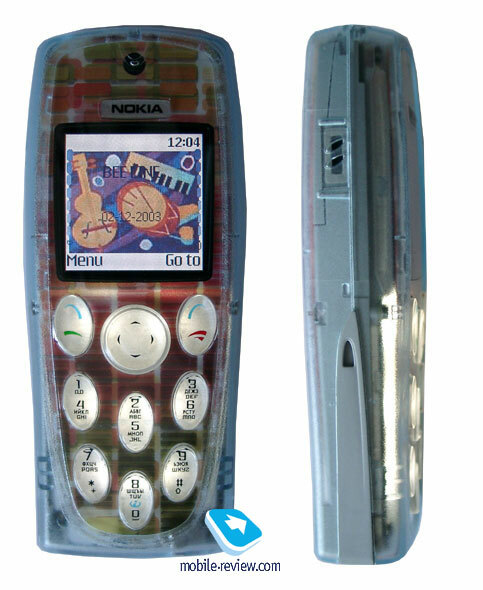 Radio is typical for Nokia phones, nothing new was introduced in this model. Both manual and automatic tuning are present, you can give names to the radio stations. Stereo headset is included in the package. You can also use loudspeaker in order to listen radio with your friends, but the headset must be still connected, because it acts as an antenna. The quality of FM-radio is excellent. Built-in camera allows taking pictures in two resolutions – CIF (352x288 pixels) and portrait mode (80x96 pixels). The picture quality is far from being good. When you're using view finder – I recommend you not making any quick moves, because the phone can’t always trace it. In our specimen the sound of shutter appeared after the picture was taken. 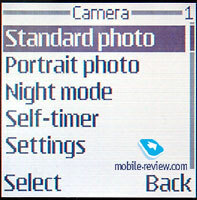 Camera’s settings are spartan, night shot mode is present as well as three types of picture quality. Files are stored in JPEC format. After transferring photos to PC - they look really nice (comparing to the competitors), you can certain of that by looking at the pictures shown in this review. The funny thing is that we had to transfer them on SE T630 first; and only then to PC. Nokia 3200 didn’t wish to send them via IrDA to my notebook for some unknown reason, even though it synched with it. 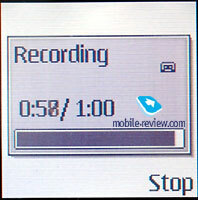 Dictaphone allows recording unlimited amount of files with the length not exceeding 1 minute. 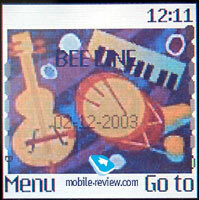 Each of them can be attached to MMS (ARM format), or used as ring tone. Organizer. 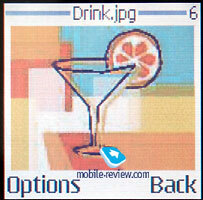 This function is similar to ones used at previous models, Nokia 6610 for example. You can enter from 50 up to 100 entries, the number depends on their length. Automatic deletion of old entries is supported as well. 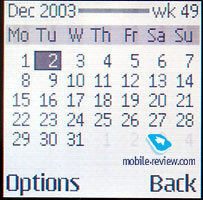 Calendar can be viewed in several ways: monthly, weekly or in a new way – a list of entries divided by hours. The entries can be classified in the following groups: meeting, call, birthday, reminder, and note. Each entry can be supplied with unique sound alert and time of notification. Alarm Clock is really simple, you can set FM radio as the alarm, but you mustn’t forget to leave the hands-free plugged in, otherwise this function remains useless. The calculator is also very simple. Applications. This menu has two sub-menus – Games and Collection. The first menu was supposed to have pre-installed Java-applications, World Time function – for example, but it doesn’t have any of them. You will have to download them manually. 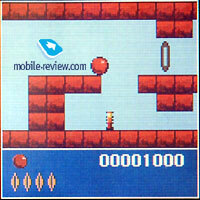 The two games are Bounce and Virtual Me. 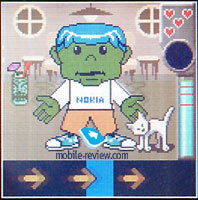 Bounce becomes really popular among Nokia users, meanwhile the other games is rather boring, you just have to press definite buttons in order to manipulate the character. Services. Wap-browser is located here, it’s version is 2.0. Ring tone volume is loud and similar to other Nokia phones. The ring tone itself is polyphonic, would have been rather weird to expect something else nowadays. Its quality is much worse than in Korean phones, which is a tradition. Vibrating alert is average, although it’s hard to feel it if the phone is located somewhere far from your body, in winter jacket, for example. Melodies sound pleasantly, but don’t expect much from them, after all its 16-tone polyphony. From now on Nokia staffs each new model with EDGE, which is not really demanded at the moment. GPRS class 10 (4+1 or 3+2), looks far more interesting. 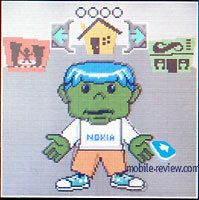 Nokia decided to present their new feature – automatic volume control with the release of Nokia 3200. The phone will adjust/reduce the speaker’s volume depending on the surroundings. 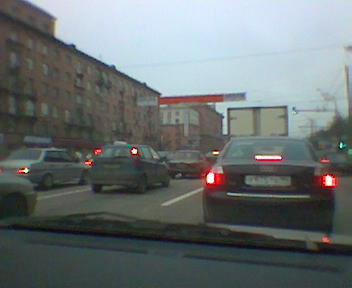 For example, if you’re walking on the street – the volume will be adjusted, and when you will enter a building – it will be reduced back to normal. In the near future this feature will replace volume control buttons on the phone’s case. This feature will become typical for the next phones from Nokia. Network reception quality is good, the phone works stable in various conditions. This model is targeted for youth, it’s obvious if you look at the phone – original design, exchangeable templates. Built-in camera proves that this phone is for those, who like to follow the progress, and don’t wish spending a lot of money on new gadgets and phones. Main competitors for this model will be Motorola E365, Siemens MC60, Alcatel 735. At the moment Nokia 3200 can’t be very competitive with it’s opponents due to the price, it’s about 300 dollars which seems set too high. The true price should be 250$, with Nokia’s brand included, not more. The phone has nice functions and is well-balanced. It could be a real competitor for Alcatel 735 (the best model in this segment), and perhaps even Motorola E365 (the phone has more functions, but cost the same money). SAR level is 0.56 W/kg (European standard).